My folks (with VF) were just upgraded to a new RBI ISAM about 10 days ago. Previously they were on a conklin (!!! ), their sync rate was 7.8mbit (adsl1), but the max they could ever achieve was 1mbit/sec due to overloading. Since the upgrade their router is now syncing at 15.7mbit/sec, and is showing an adsl2+ profile. However, on speed tests the download is consistently maxing out at ~7.6mbit/sec, I have tested this with the vodafone, spark, and WxC speed test server, all show identical download speeds. The speeds do not vary during the day, consistently 7.6mbit/sec. 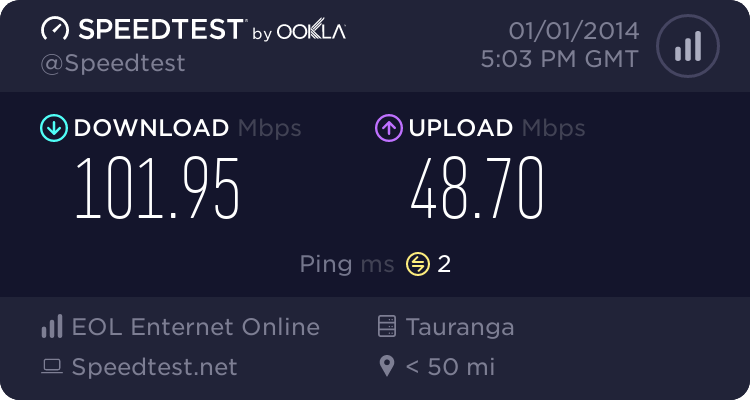 This leads me to believe that they are still on an old adsl1 profile, despite syncing at adsl2+ speeds (see problem 5 here http://www.geekzone.co.nz/forums.asp?forumid=49&topicid=115420). Is this normal for when an exchanged is commissioned? Or should the speeds have increased immediately? I have tried resetting the router etc. Happy to provide more details in pm. Hello... Our robot found some keywords in your post, so here is an automated reply with some important things to note regarding broadband speeds. - you read this topic and follow the instructions there. Most of the problems with speed are likely to be related to internal wiring issues. Read this discussion to find out more about this. Your ISP is not intentionally slowing you down today (unless you are on a managed plan). Also if this is the school holidays it's likely you will notice slower than usual speed due to more users online. A master splitter is required for VDSL2 and in most cases will improve speeds on DSL connections. Regular disconnections can be a monitored alarm or a set top box trying to connect. If there's an alarm connected to your line even if you don't have an alarm contract it may still try to connect so it's worth checking. - Are you receiving a substandard ULL ADSL2+ connection from your ISP? You'll still be on a ADSL1 profile by the sounds of things either on Chorus or Vodafone, it is also likely that Chorus has not fully "unlocked" the cabinet for full speeds and it could be in a testing phase. If JohnR is around he should be able to point you in the right direction. It can take upwards of 3-4 weeks for a cabinet to be fully commissioned and customers to have new profiles. Alrighty, thanks a lot guys. RBI upgrade here, cabinet (WAK/C) had a wait for a power meter to be installed to it, but soon as that was done it was full speed away. The cabinet down in the valley (WAK/B) however followed a slightly different process where the switchover from conklin to cabinet was done, initially restricting to adsl1 syncs still, a little while later the adsl2+ syncs were enabled but still only adsl1 bandwidth. Give it time, if your already seeing adsl2+ syncs thats a good sign it should be not tooo far off now. On the upside, your likely not congested to 8mbit like you were on the conklin!